Ever find yourself stuck in a rut when it comes to the kids tea, my own end up with pasta, sausages, fish fingers and chicken on a loop, interspersed with the odd inspiration of a home-made pie or fish pie etc., but as a busy working mum, it's often hard to find inspiration. 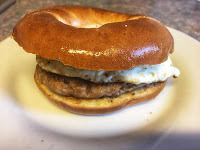 Tonight I had a rare moment of inspiration, I deconstructed a sausage and egg "mcmuffin., actually, I de-skinned a few sausages and went from there, but I have to say the outcome was "awesome"! Cut the skin of the sausages and remove the sausage meat, I made the patties out of 2 sausages per pattie. Fried in a little oil, and when near, fried the egg too. Toasted the bagel, and combine. Good article, very interesting, very knowledgeable in it.